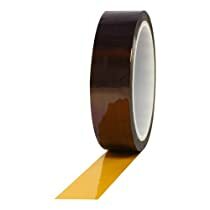 ProTape pro 950 anti-static polyimide film tape. It is an ideally suited for continuous high temperature operating conditions. It is used as a ground, barrier and phase insulation in high performance torridal coils, high frequency motors, also for end turn bundling and connection insulation in small motors. It is also used for cross-over insulation and out wraps on bobbin wound and form wound coils for large rotating machines to bundle conductors and reinforce insulation. And also used as wave solder masking of printed circuit boards. Silicone adhesive provides solvent resistance and outstanding high temperature adhesion. It combines a thin conformable backing with outstanding puncture, tear and abrasion resistance at high temperature levels. Features includes good adhesion, good tensile strength, low temperature application, short term, high temperature resistance, clean removal, good chemical and solvent resistance, UV resistant, easy unwind, good abrasion and moisture resistance, waterproof backing. Applications includes surface protection, powder coated surfaces, splicing, coil wrap banding, ciruit board protection. 1-millimeters polyimide film/kapton backing. 1-millimeters backing thickness. 2.5-mils total tape thickness. 30 pounds per inch tensile strength. 70 Percent elongation. 25 ounces per inch adhesion to steel. 7500 Volts dielectric strength (D-149-97). 500 degree F oven residue testing temperature resistance. 350 degree F/180 degree C insulation class, centigrade. UL certified. Measures 36 yards length by 1-inches width.